Coordinates: 40°43′52″N 73°59′34″W﻿ / ﻿40.7312°N 73.9927°W﻿ / 40.7312; -73.9927The 9th Street Art Exhibition, otherwise known as the 9th St. Show or Ninth Street Show was held on May 21-June 10, 1951. This was a historical, ground-breaking exhibition, gathering of a number of notable artists, and it was the stepping-out of the post war New York avant-garde, collectively known as the New York School. The show was hung by Leo Castelli, as he was liked by most of the artists and thought of as someone who would hang the exhibition without favoritism. The opening of the show was a great success. According to the critic, historian, and curator Bruce Altshuler, "It appeared as though a line had been crossed, a step into a larger art world whose future was bright with possibility." Several artists who served in World War II did not have the attention of the Art critics of the post-World War II era. Their studios were located in lower Manhattan in the area bounded by 8th and 12th street between First and Sixth Avenues during the late 1940s and early 1950s. The artists who occupied these studios were called the Downtown Group. In 1949 the Downtown Group founded an artists' club, named "The Club" located at 39 East 8th Street. The members, with few exceptions, were mostly war veterans, 40 years old, men, and professional artists. Their weekly discussions in The Club led to the idea of organizing an exhibition. A linoleum cut poster was created by Franz Kline to promote the show. The show was located at 60 East 9th Street in the first floor and the basement of a building that was about to be demolished. Barbara Rose: "Could you tell me about why the Ninth Street show was organized and how it came into being and what its consequences were? How you were involved?" Leo Castelli: "Well, it came into being as an outgrowth precisely of the things that you've been asking constantly about: of what kind of feelings the American painters had in connection with their position toward the European painters. It was sort of an outburst of pride in their own strength. And we considered this almost as the first Salon des Independents; this is what I called it as a matter of fact. I was very proud of that aspect of it. I thought that never before anything of the kind had occurred in America. We had about ninety painters in it and they were almost exclusively I would say, because there were a few exceptions, composed of artists who were involved with The Club. Not all of them members but at least people who gravitated around The Club and came often because also non-members were admitted there, of course. So the major figures there were: de Kooning, who had taken an important hand in the development of The Club; actually he was much more active then in, say, group activities than he is now; he has become rather solitary, as you know. De Kooning was very important. Franz Kline was very important, Marca-Relli was a good organizer; he was involved in it." Rose: "Was all the painting abstract?" Castelli: "It was mostly I would say abstract, yes. Because people like Larry Rivers and Joan Mitchell, Grace Hartigan - Joan Mitchell stayed abstract - especially those two who later became figurative painting came right after that." Rose: "Did the Show make much of a splash? Was there much public reaction to it?" Castelli: "Well, it was a great event. We had a stream right across the street. It was a very wonderful warm day. This was in an empty store - in a house that was up for demolition and we had paid, I think, $70 to have it for two months before it got demolished. All the painters had participated in refurbishing it, in painting this place that was almost abandoned. And it was very nice and neat. There are photographs to show you how it looked. And Franz had designed the announcement which was just a sheet of paper. I think it cost twenty-five dollars. And it seemed a lot of money. I sort of footed most of the bill although I didn't have much money either. I think that I forked out as much as $200 and that seemed a tremendous amount of money for the rent, and for this catalogue that cost $25 the Franz designed. We were all there for three days hanging and re-hanging the show. All kinds of painters who were dissatisfied with the way they hung, I remember. Rauschenberg was included in it, Reinhardt was included in it. David Smith, poor man, had a beautiful sculpture right in the window. Pollock was included, although he did not participate too much in Club activities. But he was painting." 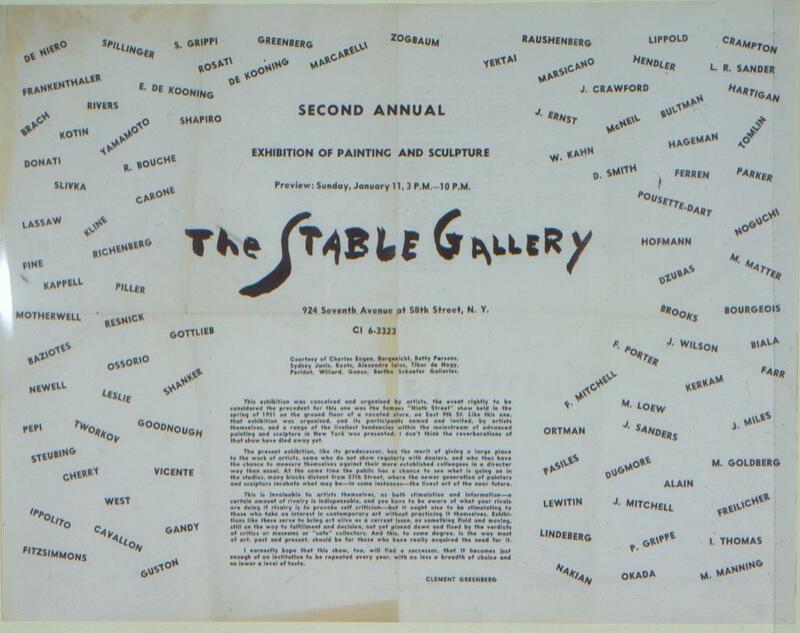 Altshuler writes that, "The artists celebrated not only the appearance of the dealers, collectors and museum people on the 9th Street, and the consequent exposure of their work but they celebrated the creation and the strength of a living community of significant dimensions. Aaron Siskind, who himself was a member of the New York School, documented the exhibition with a series of photographs. 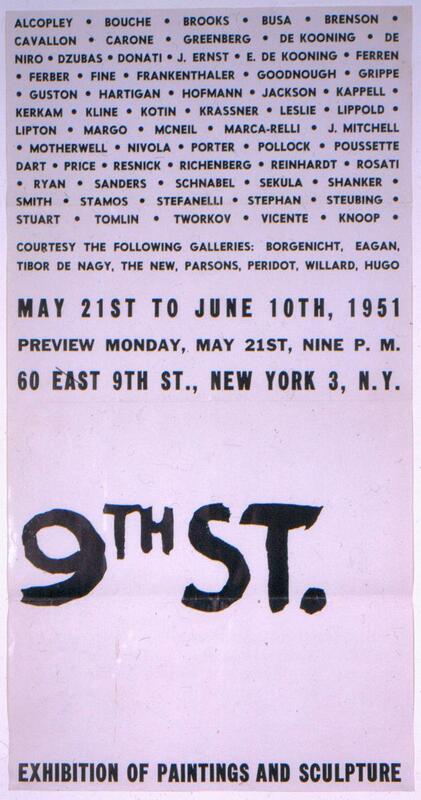 This exhibition was conceived and organized by artists, the event rightly to be considered the precedent for this one was the famous "Ninth Street" show held in the spring of 1951 on the ground floor of a vacated store, on East 9th St. Like this one, that exhibition was organized, and its participants named and invited, by artists themselves, and a range of the liveliest tendencies within the mainstream of advanced painting and sculpture was presented. I don't think the reverberations of that show have died away yet..."
In 2006, Findlay Fine Art Gallery in New York City had a well-researched exhibition honoring the lesser known artists that were included in the 9th Street Art Exhibition. ^ "Prolific Years: Exhibitions and Alcoholism". de Kooning Experts. Archived from the original on 2016-03-03. Retrieved 2015-12-28. ^ Bruce Altshuler, Avant-Garde In Exhibition New Art in the 20th Century, (New York: Harry N. Abrams, Inc., 1994) ISBN 0-8109-3637-2 Chapter 9, pp.168-169. ^ "Uptown gallery revisits Ninth St. exhibit". thevillager.com. Retrieved 2015-12-28. Bruce Altshuler, Avant-Garde In Exhibition New Art in the 20th Century, (New York: Harry N. Abrams, Inc., 1994) ISBN 0-8109-3637-2 Chapter 9.